The following is a brief update from Forest Growers Research Ltd on a current project being undertaken by Dr Hunter Harrill at School of Forestry, University of Canterbury and funded through the Forest Growers Levy, as part of baseline measurements for a new research programme. 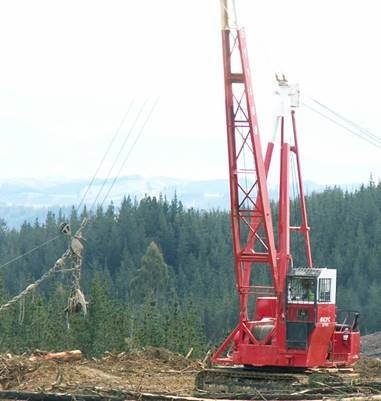 There are currently 193 yarder entries (compared to 305 yarders in 2012) from the survey of all the larger forestry companies. This suggests fewer cable yarders working in corporate forests in 2018. So where have they gone? Possibly into small forests and woodlots and haven’t been picked up in the survey yet. There has been an increase in swing yarders (from 30% to 39% of total) and a reduction in tower haulers (67% to 56%). Regarding brands the top three from 2012 are still the same – Madill (33%, now 36%), Thunderbird (13%, now 11%) and Brightwater (8%, now 3%). There are some new hauler brands appearing now, such as Active, T-Mar and Koller, and some of the older NZ brands such as Dispatch, Wilson and Bellis have reduced in number, or have disappeared completely. The most common models are now the Madill 124/Madill 123 swing yarders (18% of total), compared to 2012 when the 70 foot towers were the most common (Madill 071/Thunderbird TMY70) making up 19% of the total back then. Regarding rigging configurations, there are fewer North Bend/scab skyline/highlead systems (from 76% down to 29% of operations) and a large increase in the use of grapples (both mechanical and motorised) from 4% in 2012 to 55% now. The ground-based crew census is now underway and Hunter is trying to contact as many of the small forest/woodlot contractors as possible. So if you are currently harvesting your forest or know of operations in your area, please contact Hunter Harrill (hunter.harrill@canterbury.ac.nz) and give him the details of the operation.